BT Group had grand plans to get rid of the iconic British red phone box, but for some reason it never banked on the Brits' sense of nostalgia. The company wanted to get rid of about4,500 of its remaining 12,000 red phone booths, saying that the boxes weren't profitable anymore in this age of ubiquitous cell-phone use. But after the uproar the announcement caused, the company grudgingly agreed to let villages and townships keep their beloved red boxes by "adopting" them for about £1 (about $1.80). Of course, that was for the box. Not a working phone inside. A working phone costs extra -- an annual fee of £500 (about $900). The £1 price to keep a dead phone box is generous, considering there are a couple on sale on eBay right now for about $4,000 each. But I don't buy BT's story that pay phones are a grim business in the cell phone era. The company is charging towns £500 to keep the phones working. That's far more than the £300 on average it's getting from phones under a new advertising deal. 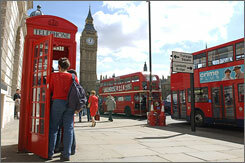 Several models of the iconic red phone box have been produced since the first concrete box was manufactured in 1920. Architect Giles Gilbert Scott won a design contest with his domed top model, which was produced in cast iron in 1926. Since then the red booths have become a symbol of Britain. Brits have installed them in old age homes in hopes they will help dementia victims remember more. BT has been on a slow eradication campaign for years, with many towns fighting to preseve their boxes. Seems to me there's room for both nostalgia and growth.